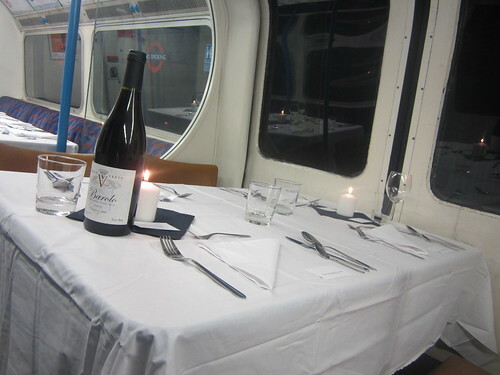 For those who were asking when the next Tube carriage supper club, there's bad news and good news. The bad news is that Alex had set one up for 11th May which sold out in about an hour. The good news is he's now going to run another on the 25th May, to cope with the demand and there's also a little extra capacity. 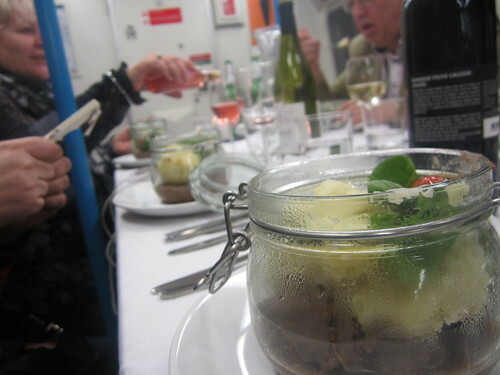 It really was great fun and you can find out more about what happened when I went to last Tube Carriage Supper Club. My friend Rosana from Hot & Chilli, who told me about the event also has a post from the event. Once again the menu looks great - it's different from the one myself and Rosana had and also being late May you'll be warmer than we were. It's a lovely opportunity to roam around the old exhibits at the Walthamstow Steam Museum too. Book online here. 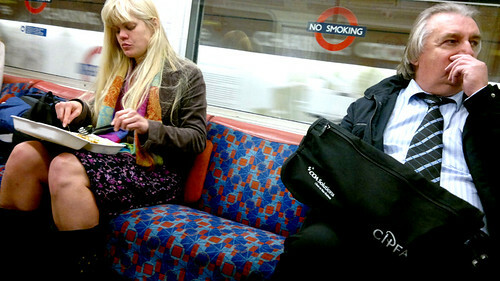 Eating on the Tube - love it or hate it? TfL launched a poster campaign a few years ago encouraging us not to eat smelly food on the Tube which almost caused a diplomatic incident between Britain & Italy due to its implication that all Italian food is smelly. We've probably all been on the London Underground when someone's been eating chips, chicken, a kebab or even a packet of cheese and onion crisps, and it's really got up our noses. 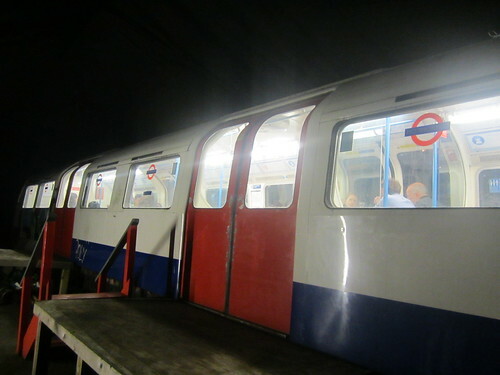 However, not all Tube food is a bad thing as I had the pleasure of dining on an old Victoria Line carriage last weekend. 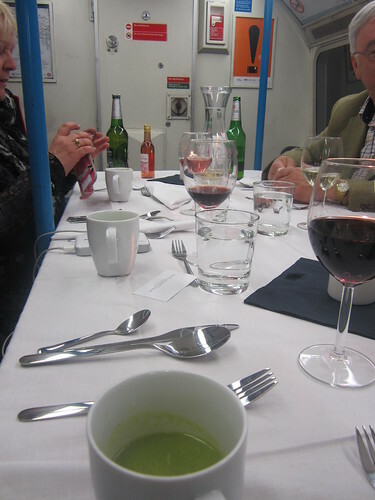 This wasn't a rushed sarnie or breakfast croissant on the Tube, but a delicious four course meal as part of the Basement Galley's celebrations of the London Underground's 150th anniversary. 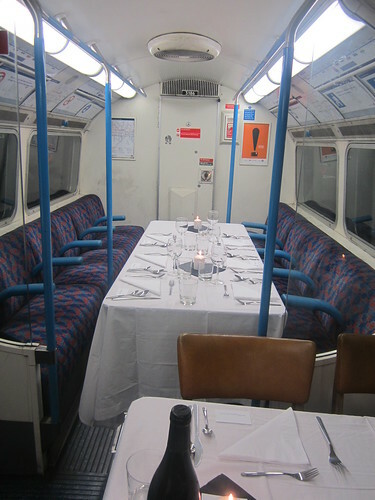 The by-line of Alex and Tom's supperclub is "Underground Dining", but this was the first time they'd taken the whole concept really Undeground. OK we weren't on a carriage physically travelling on the Victoria Line itself, but on an old Victoria Line train stationed at the Walthamstow Pumphouse Museum. If you've been to a supperclub before you'll know that the fun is all in the unknown. You usually don't know the location until the last minute. You don't know who you'll be eating with. 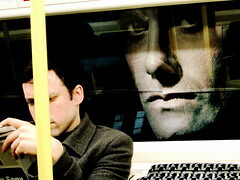 Even though this was miles away from where I lived, I knew I couldn't turn down the opportunity of eating on the Tube. My friend Rosana Mc Phee from Hot & Chilli who discovered the event, met me at Walthamstow Central Tube and we then spent about 10 minutes trying to find the right bus to get to the Museum. Fortunately some fellow diners were also on the bus & confirmed we were going the right way. The Pumphouse Museum is a bit ramshackle from the outside, with old rusting coaches, buses and bus stops "displayed" in a fairly haphazard fashion. So it was with some trepidation that we wandered round to back of the Museum to our train which was hidden in a very large marquee. Once through the sliding doors we were more relieved. All looked extremely well set out, crisp white table cloths and candles mixed against the backdrop of in-line carriage maps and old Tube posters. 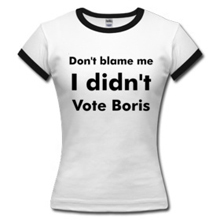 We stood in the aisles chatting, drinking wine (we weren't strictly on public transport so not subject the Boris booze ban!) and getting to know our fellow diners. The tables were set so most of us were sitting on the train's own comfy moquette seats whereas others were on seats by the sliding doors. We settled down to our starter of Green Pea & Basil Purée followed by Salmon poached in a Black Pepper Broth, Rucola Salad, Truffle & Parmesan Vinaigrette. With the sounds of the sliding doors swooshing open & shut as the food was carried in and our empty plates taken out, it felt as though the train should have been moving. 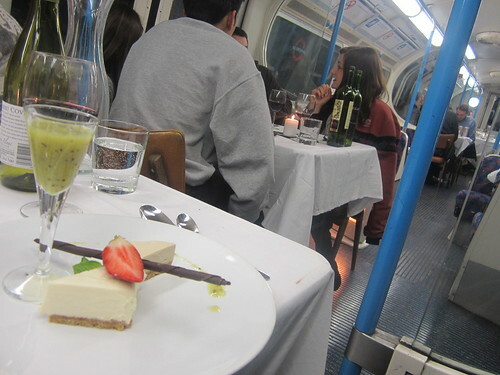 However, it didn't take long to forget that you were in a train and just spend time enjoying the meal, wine and company. There were only 22 of us that night, but Alex thinks that by re-arranging the seating a little he could fit around 30 people into the carriage. Our main course was piping hot, which was some feat considering Alex & his team only had a very small kitchen at the Museum to heat things up in. Kilner Jar appeared full of yummy slow braised beef in a Móle sauce with garlic mash and wilted spinach. This was followed by a Pimm’s Fruit Salad and a beautifully presented plate of sliced of cheesecake: White Chocolate &; Vanilla, Lapsang Souchong Tea, with a glass of Kiwi Smoothie. Over tea and coffee we shared our amazement that no one (well no one as far as we knew had run a supperclub in a Tube carriage) and applauded Alex for his idea and great food. It would be lovely to return in the summer for an event like this. Firstly, as it was a little cold and secondly, as I wondered how it might look with less bright lighting from the Tube's overhead lights and more reliance on candlelight. Both my and Rosana's Tweets during the meal led to many excited responses saying "How did you hear about this? ", "When's the next one?". Keep an eye on the Basement Galley's Twitter feed for when the next one will be, as Alex says he'll definitely run another. 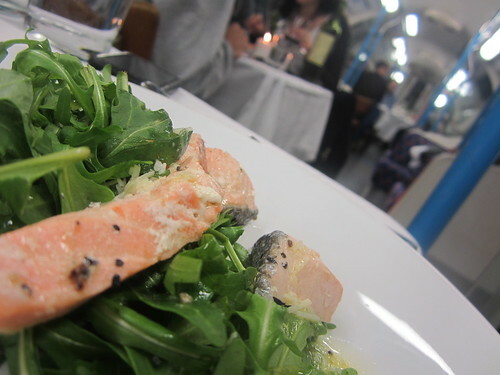 There's some more of my photos from the Victoria Line Train Supper Club and the Pumphouse Museum here. 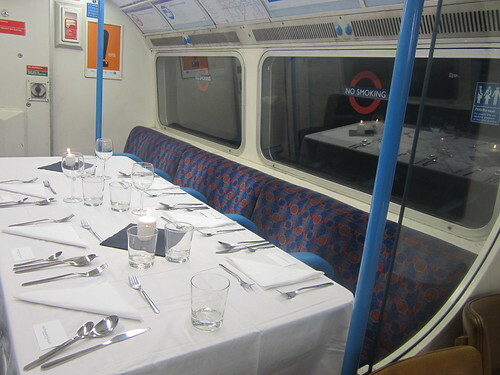 In the meantime, next time you're eating on the Tube, close your eyes and imagine the white tablecloths, glasses, cutlery and candles and you'll get a rough idea of our experience. 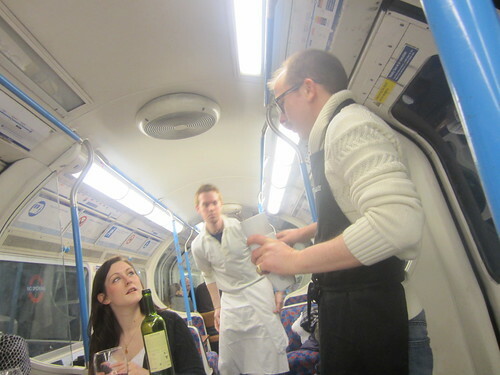 UPDATE - 29th April 2013 - due to popular demand, Alex is having another two supper clubs on this train. 11th May is already sold out but you can book tickets for the one on the 25th May now. 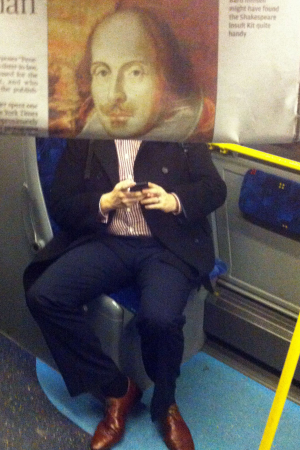 Looking for a way to brighten up your Tube commute? An anoymous photographer is making quite a splash across the net right now by strategically using free newspapers to create some fun forced perspective pictures. 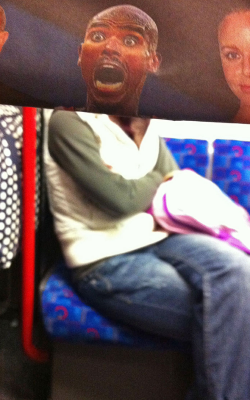 "Photo bombing" fellow commuters means you can potentially get to see celebrities travelling with you every day. The photos are mostly on buses or on mainline train journeys but you can easily see how this would work for London Underground journeys. 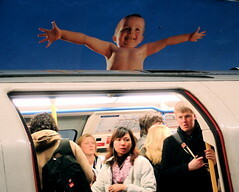 Chutney Bannister's "The Surreal Line" set of photos on the Tube also show how cross platform ads can mingle with commuters to create some interesting perspectives. Thanks to @MichalD for initially alerting me the to current "photo bombing" photos and you can see the full set of them all on Shortlist. Here's a date for your diaries. 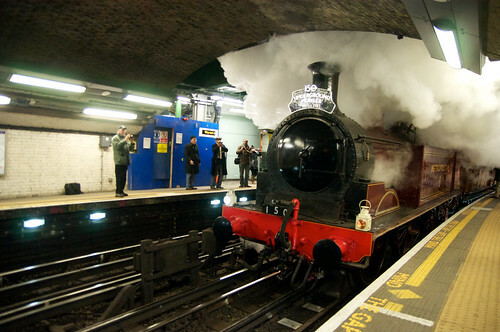 If you missed out on seeing the Underground steam engine that travelled on the Tube system earlier this year, you can get a close up look at it at the Acton Depot Open Weekend on April 13th and 14th. Also on display will be the restored Metropolitan Line 353 carriage which again was part of the 150th anniversary celebrations of the London Underground. 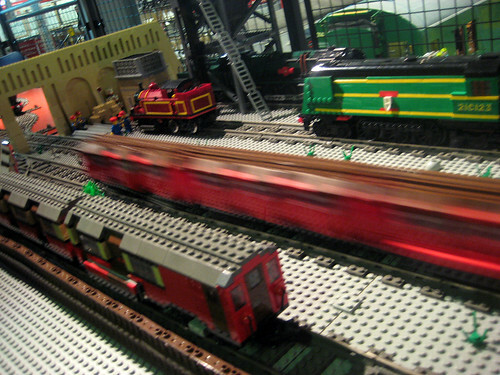 Model displays will feature miniatures of the Met No.1, and a Lego fans will be kept happy with a representation of Baker Street in 1863. You can have a footplate ride on Ffestiniog Railway’s 150 year old steam engine Prince. There's also steam rides on the Acton Miniature Railway, film screenings, hands on workshops where you can get the opportunity to make your own model steam train, talks, and book signings. More details on the open weekend here. It's always an extremely popular weekend as the queues for the event often snake back to Acton Town Tube station. With a chance to see the steam train up close I imagine this weekend will be busier than usual. I've been to the weekends there several times and spent hours pottering around the Museum’s collection. There's over 400,000 objects at the Depot including signs, vehicles, old ticket machines, station clocks, small objects, posters and more. 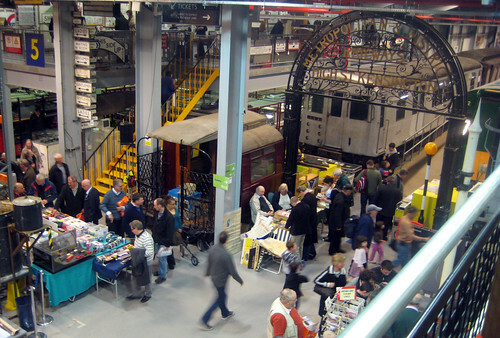 Tickets cost £10.00 for adults, £8.00 for senior citizens, £6.50 concessions and £5.00 London Transport Museum Friends. Accompanied children under 16 get in free. 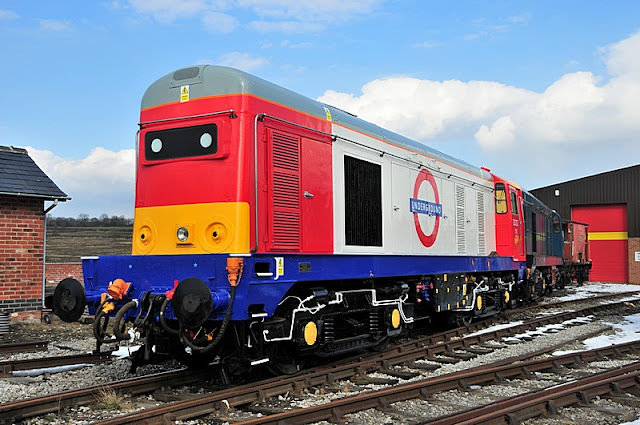 For reasons as yet unknown an A Class 20 diesel locomotive at the Midland Railway Centre, has been painted in London Underground corporate livery. The Midland Railway Centre is one of the homes for old trains undergoing refurbishment. More pictures of the train above can be found here. 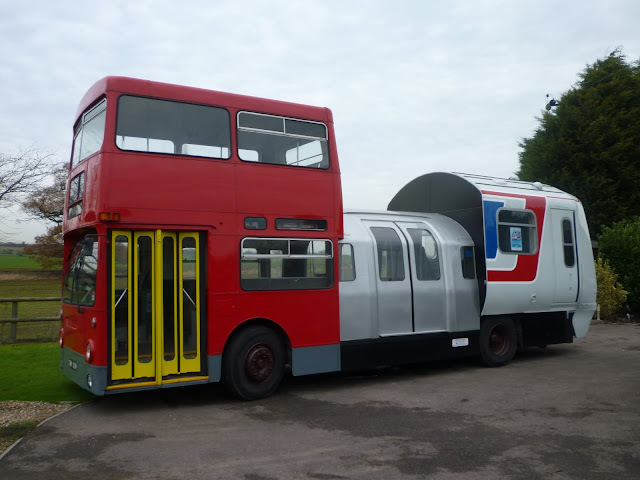 I love the idea that old locomative trains can get a make-over as a London Underground train. 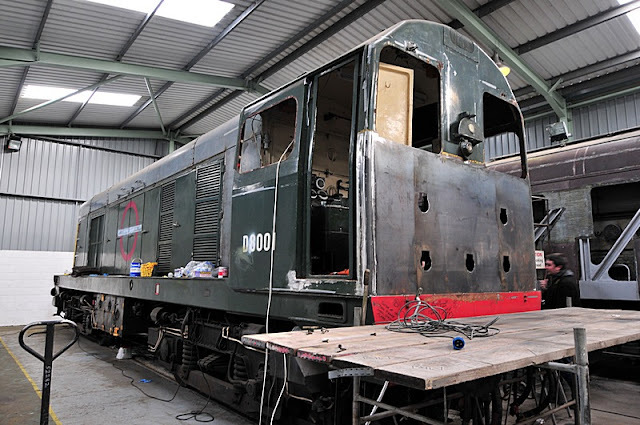 Here's another carriage undergoing a makeover. You can see that most of its cab end has been replated. Known in the trade as LU Choppers, it's unlikely that you'll get to see them in London, but they'd certainly turn a few heads if they made it down here. Thanks to @julog90 for bringing this to my attention.